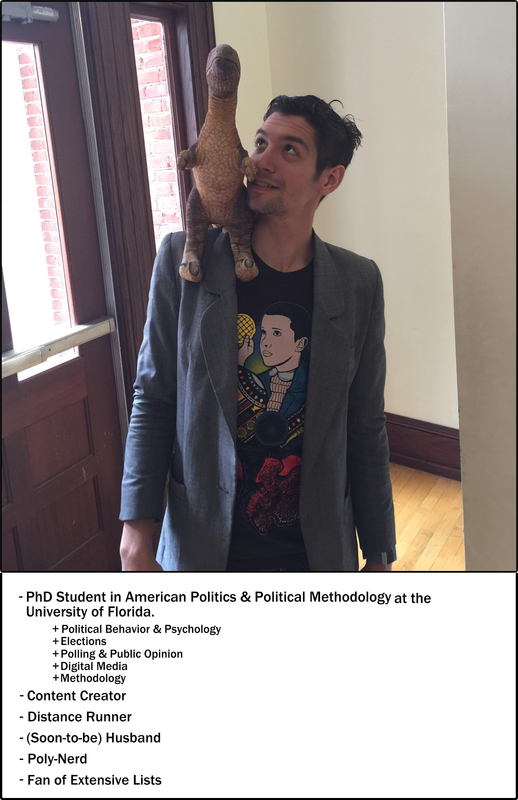 UF PhD Student in American Politics and Political Methodology. I'm presenting two papers at MPSA 2019. The first is what I'm calling a methodologically expanded but semantically contracted version of my dissertation prospectus. (That is, more data but fewer words. Which is probably for the best-- the prospectus was literally 70 pages long sans bibliography. I was asked to "convince" my committee that "there's something actually there" and I may have gone a ta overboard). This specific presentation is looking at the effects of video games on political participation. I'm conflicted about putting a working version of this paper up since it is, in effect, the kernels of two separate papers, one about media effects and another about social capital. Consequently, both sections are more sparse on the lit and theory than I'd like because I had a lot of ground to cover and could really only afford to use broad strokes. I still might for the sake of showing how the project is evolving and to invite feedback on general design, but I hate putting up things bellow a certain threshold of "imperfect" which I think this paper hits. We'll see. But, at the very least, the presentation is here and I'm more than happy to share that! How Purple Were We in 2016? Democrats and Millenials Prefer “Socialism” over “Capitalism.” Why?